Argentina's controversial First Lady is the subject of this dynamic musical masterpiece. As an illegitimate fifteen-year-old, Eva Peron escaped her dirt-poor existence for the bright lights of Buenos Aires. Driven by ambition and blessed with charisma, she was a starlet at twenty-two, the president's mistress at twenty-four, First Lady at twenty-seven, and dead at thirty-three. Eva Peron, "saint to the working class, reviled by the aristocracy and mistrusted by the military", was destined to leave a fascinating political legacy unique in the 20th century. 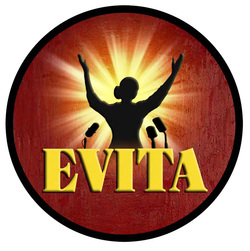 Told through a compelling score that fuses haunting chorales with exuberant Latin, pop and jazz influences, Evita creates an arresting theatrical portrait as complex as the woman herself. Winner of 7 Tony Awards.